Blog from Nadi, Fiji | Margaret in Wonderlands..
On the flight from Australia to Fiji. I sat next to a Fijian woman who started warning me about bringing water to the islands otherwise I would get charged loads. She was also talking about people trying to con foreigners. Always a good advertisement for the island :) I got the flight and landed about 6am and met Charlie who was English and staying in the same hostel. She was doing an internship for 4 months in Fiji doing some marine biology. We waited an hour and then got back to the hostel. On the way in I was really surprised to see how green Fiji looked from the plane. There were a few small little town on the way through and people selling coconut juice on the streets. The hostel was a nice complex and I had a nap for a few hours. I was shattered after the night flight. When I woke we met Carly and Camilla from our room and all headed off to check our Nadi town. We saw the colourful temple at the end of the high street and looked in a few stalls. I bought a necklace with a shell on a black rope and a new bracelet for the collection. A guy did try and lure us to his friend shop but we made a quick exit. Later on we had dinner together and sat up talking before we headed for bed. Tom from Christchurch was in our room and he has offered to take me around Duedin so that will be cool. I was up at 6.45 ready for my bus. I had decided to stay for 2 nights on 3 islands following guidance from Chantel and friends to Coral View on Tavewa Island, Wayalailai Ecohaven resort on Waya Lakai Island and Octupus resort on Waya Island. The boat ride to Coral View took 5 hours and it was pretty rocky but the reception was very warm when we arrived. The islands were absolutely stunning and there must have been 20 stops or so. When I passed both Wayalailai and Octupus I was happy with my choices. The great thing was I could book my islands on the boat so it was really easy. Anywho when we arrived on the island they greeted us with a loud Bula and shook hands with a fruit juice. We then had lunch which was rice, salad and some veggie option and then checked in. The dorm was a 15 bed sleeper but it was massive, air con and spacious. It was a great island, the beach was not great but it had nice chairs on the grass and stunning views of the gorgeous blue sea. There was a walk to the top of the summit which took about 30 mins and was very steep but the view was spectacular and overlooked the islands. We waited for the sunset but it took a while and dinner was calling so I headed down. After dinner the members of the island preformed a welcome song and greeted us all again. We played a few games and then most people headed for bed. The next day I baked myself and chilled out. I really needed this as it had been all go for a while so time to myself was all good. I love meeting people but it does get exhausting as well. I tried to do some snorkling later on but the gear I borrowed from my German friend was to big so water kept getting in the snorkle and there were strong waves so I gave up. I knew I would do it on another island. Later on there were new people so we did some more lively games including dancing and some other card games and a group sat out the back and carried on drinking. The next day I left after a lovely lunch of wraps with a dalh and they preformed the Isle song of farewell. It was a lovely experience but I was really looking forward to the next island. These people knew how to sing the Isle farewell song so well it really touched your heart as it was so touching and they had amazing voices. They were also so friendly they made the island special. The next day and a new island was Wayalalai and this was also lovely except the food was nicer and bigger portions which was really good. The dorms here were not so great though and I was warned about bugs not long after I got there (never good) I luckily was not bitten when I was there but some others were. On the first day I made a woven bangle for $5 under some huts down by the beach. 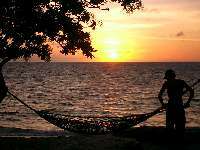 I chilled on the hammocks as well down by the beach for a while just listening to the sea. I remet up with Maria and Steph from Coral View and hung out with them and Lena and Philip from Germany. We hung out down by the bar that evening. Dinner consisted of potatoes, chicken, veg and sausages and it was GOOOODDDD. I thoroughly enjoyed it. The next day and people were off doing activities. I wanted to do a village visit but there were no others who wanted to do it so I could not go. I wandered down the beach as I know there was a village nearby and met Charlotte who came out to meet me and we chatted for a little while. She had a one year old and lived there. She asked for any make up or clothes so I said I would bring her a top the next day. As I waited for dinner I tried some coconut juice, I was not too sure about it.. it was a bit bitter for me but I love coconut!! Later on there was a Fijian style night on and people from the village came and preformed for us. They started with a cava ceremony. Cava is ground from the root of the pepper tree and is left to harvest for 11-14 years. It is then mixed with water and can be very strong. I managed to get most of it down me.. classy.We then had a Fijian style dinner also known as Lobo where it is cooked under the ground with hot rocks on top. The dinner consisted of sweet potato, chicken, lamb, beef, corn and some spinich with coconut which was delicious but then it was all really good to be honest. They then preformed a welcome song and then did 4dances including the warrior dance. We were on the front row so a guy took a liking to me and kept trying to scare me with his weapon but I did not flinch and so he seemed like he wanted to try and scare me. He was very funny and cheeky and amused us immensly. Haha doesn't he know I am from Harrow ;) The women preformed the farewell dance. They then did 4 songs as well, one included was Isle. It's a beautiful farewell song. We then had to body up with a partner and dance for a bit. I danced with a German guy I met on the boat a few days earlier. The last island was Octupus resort and boy it was definitely a case of the best for last. It was a stunning island and resort. They welcomed us from the boat with a welcome song and a juice shake. I paid an extra $52.50 per night but it was so worth it. I went to my dorm and it was a lovely room with 15 beds in it and even our own towels. I quickly met Hayley in my dorm who lives 15 mins away from me at home and drives past my road every morning. She was lovely and traveling with her friend Lisa. I hung out with them for the next few days and really enjoyed their company. We had a good laugh together. When I arrived the weather was bad so I took a little nap as I was shattered from the early morning. Hayley gave me a shout and I went out and had some lunch. I opted for a fish burger which was scrummy. I then chilled on the beach with Hayley and Lisa. Later on there was a cava ceremony which I attended, getting used to the cava eh. We then had dinner and it was a fish in cream sauce with potatoes and carrots.All good but then I am sure you are used to me discussing the food I eat. It was then a quiz night so we were on a table with 4 Canadians, and an annoying know it all English girl. It was good fun and we came 3rd out of about 9 groups. The next day was my last day on the islands so I did some more snorkling, we walked to the other side of the island and took some pictures. It was a glorious day and it was hot hot hot, just how I like it ;) I soaked up some more of the beautiful weather and beach as I knew it would soon be over and beaches would not be on the list for the next part of my trip sadly. I said my goodbyes to the girls and headed for my boat back to the mainland at 3pm. It was a little late but that was all good to me. I was last off the little boat and I was barely on the large Awesome Adventures boat when the little boat moved back crushing me between the two boats. Luckily one of the guys spotted it and shouted in time to the guy to stop me being squashed anymore. Bit frightening though. I then chilled out for the next few hours whilst we went back to land, I met some old friends on the boat and just enjoyed the scenary. I stayed back in Nomads Skylodge and did washing and had a fish curry, all very exciting huh. I had a 5.40 wake up call so I wanted an earlish night ready for it and NZ. On the whole Fiji was PARADISE and I was blown away by its beauty. The islands and sea is out of this world and one of the most stunning places I have visited. However it's not just that, that makes it special. It's the people and how friendly and welcoming they are. They appear genuinely happy to welcome people and make sure guests enjoy themselves whilst in Fiji. I felt so happy in Fiji, well it's hard not to right?!! Its Fiji time baby!